'Phantom' petunia. Photo from Ball Horticultural Company. 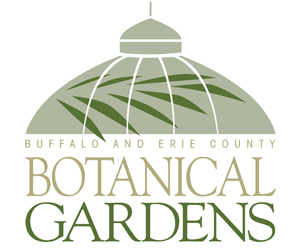 We promised to tell you more about annuals that will work well in your Buffalo area garden. Today we’re going to talk about a black annual, a drought-tolerant annual and a shade annual with colorful leaves. 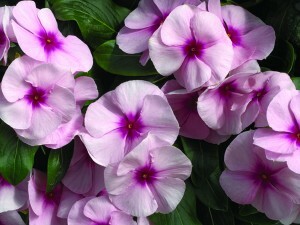 Bonus: If you love impatiens for shade, try a new variety that you can plant in sun. These tips are shared by the staff at Lockwood’s Greenhouses, 4484 Clark Street, Hamburg, NY 14075. 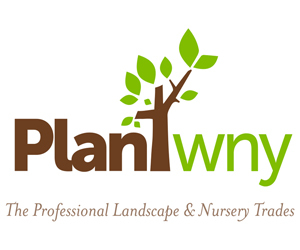 Lockwoods will exhibit at Plantasia, which will be held at the Fairgrounds Event Center, 5820 South Park Ave., Hamburg, NY 14075. Plantasia opens with a preview night tomorrow, March 21, from 5:30 – 8:30 p.m. It promises to be an evening of food, fun, cocktails and garden shopping. Tickets for the preview are $15 per person and can be purchased online. 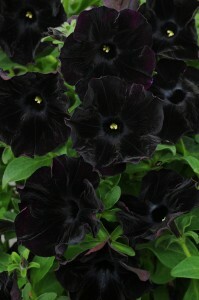 'Black Velvet' petunia. Photo from Ball Horticultural Company. Plantasia continues Thursday to Saturday, March 22 to 24 from 10 a.m. to 9 p.m. and on Sunday, March 25 from 10 a.m. to 5 p.m. Tickets are $9 general admission (get a general admission discount coupon here), $6 for senior citizens aged 60 and over, and free for children 12 and under. 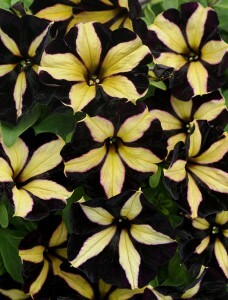 Black flowers are intriguing to many gardeners because they’re so unusual. Pictured at the beginning of this article is ‘Phantom’, which is black and yellow. A similar flower is ‘Pinstripe’, which is black and pink. 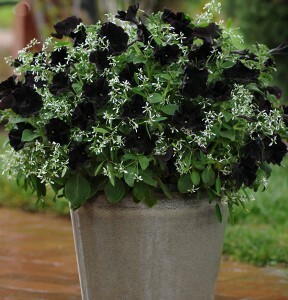 ‘Black Velvet’, seen above right, is an all-black petunia. “It has a hint of purple, but it’s quite black,” said Teresa Buchanan, general manager at Lockwood’s. “The plant habit is not so good– it gets a little leggy– but the flower is outstanding,” said Steve Lockwood, owner of Lockwood’s. Because the flower is so dark, Buchanan suggests pairing it with a white or lime green flower to make it stand out. 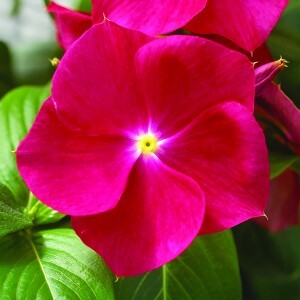 'Nirvana Red' vinca. Photo from Syngenta. If you have an especially hot and dry spot, or if you know you’re just not going to water as much as you should, you should try drought-tolerant varieties of flowering vinca. First, don’t confuse this plant with the perennial vinca vine that gets a periwinkle blue flower in spring and is used as a ground cover. Instead, these are showy ornamental annuals with flowers in shades of white, red and purple. 'NIrvana Pnk Blush' vinca. Photo from Syngenta. The ones we’re talking about today are kinds of F1 hybrid vinca. “Genetically, they’re heads and shoulders above the old traditional flowering vincas,” Lockwood said. He said he had trouble growing flowering vinca because they would rot, but the newer varieties are more tolerant of disease. The names you will look for are Titan, which is a series of upright flowering vincas; Nirvana, upright; Cora, trailing, and Serpentine, trailing. The trailing types look good in hanging baskets. You won’t see these for sale until the end of May or June because they really need the heat, Buchanan said. 'Albuquerque Midnight Sky' rex begonia. Photo from Proven Winners. It’s always a challenge to find interesting and colorful plants for shady areas. With rex begonia, the leaves provide the color. 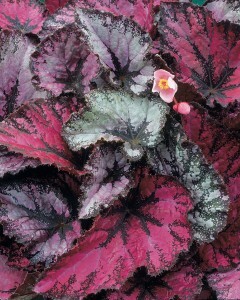 There are many, many varieties of rex begonias, with different color combinations of silver, red, pink and green. According to the Proven Winners website, the ‘Albuquerque Midnight Sky’ rex begonia seen at right can be brought in during the winter as used as a houseplant. Another popular annual for shade is impatiens, a plant with brightly colored flowers in beautiful mounds. It’s so popular that people want to grow it in the sun, too. 'Spellbound' impatiens. Photo from Syngenta. 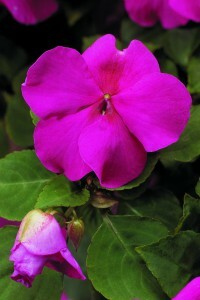 “For 50 years, people have been asking for impatiens they can grow in the sun,” Lockwood said. Meet ‘Spellbound’ impatiens, which was bred to tolerate full sun conditions. Lockwood’s grows ‘Spellbound’ from cuttings, rather than seeds. It’s more expensive to do it that way, but the color of the flower stays true. They have a semi-trailing to full-trailing habit and are popular for baskets and combination containers. Outside they are superb for ground beds, baskets and combination plantings. What’s your favorite annual? Join the discussion by leaving a comment.